Does work-life balance really exist? What is work-life balance, and can we really achieve it? What does the word ‘balance’ mean to you? Maybe you think it means something along the lines of ‘equal weight’ or ‘in equal measures’ – like balancing a set of scales. Or, perhaps it means achieving the ‘optimum amount’? That’s kind of what a ‘balanced diet’ means, right? 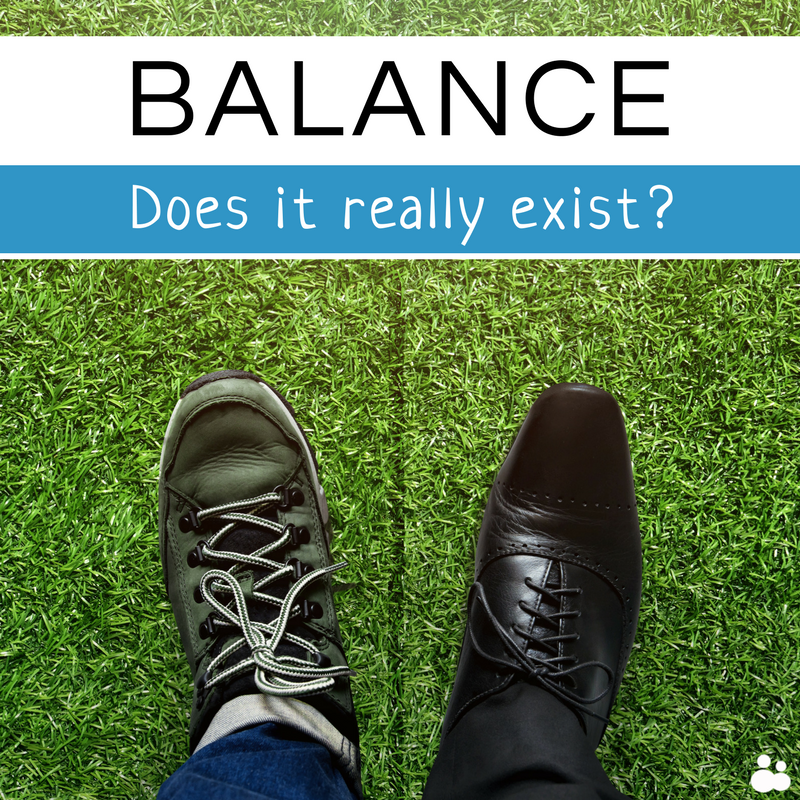 The truth is, as with many words in our vocabulary, ‘balance’ can mean many different things. The trouble comes, then, when we associate it with aspects in our lives. For instance, in relation to work. 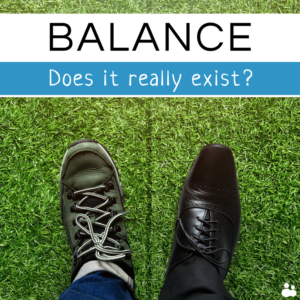 In this case, balance often implies that ‘work’ and ‘life’ are two halves of each of us, that should happen in equal measure – when, in reality, that’s not the case. So, what is the perfect balance of work and life? Here’s the thing: it’s different to each of us. It’s not about living life according to a schedule. Balance isn’t about sticking to a timetable. It’s about being happy and fulfilled. It’s about recognising what’s important to you, to help you feel appreciated and full of love for life. “When people ask me how I define what work-life balance is, I always say that I think it’s not so much about how we spend our time, it’s actually about how we feel about how we spend our time. If we are happy with that, then our work-life balance is good, and if we aren’t, then it isn’t. For many people, life outside of the 9 to 5 might be taking care of a family. For others, it might be a side-hustle or a hobby. Or for some, it might be a combination of all of these things. The important thing to remember is that the ‘life’ aspect in work-life balance isn’t the same for everyone. It’s all about how we choose to fill our time. The reason it can sometimes feel particularly hard to maintain balance, is that work and life are constantly changing. Some weeks we may find ourselves with more on at work, or with more planned in our social lives. No two weeks may look the same – and, some days you may feel more balanced than others. And that’s OK, as long as you’re not feeling stressed or overwhelmed on the regular. Developing and maintaining a good work-life balance isn’t necessarily about getting the ideal balance every single day, either. After all, that just sounds unrealistic, doesn’t it? Instead, we need to focus on how our time is spent throughout the course of the week, to make sure we have enough time for all the things that matter to us – work, rest, social time and home responsibilities. 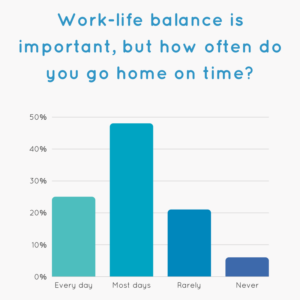 Why is being aware of our work-life balance important? It’s probably not surprising that only of a quarter of respondents reported to going home on time every day. Almost half (48%) of people said that they go home on time ‘most days’. Over a fifth (21%) of people ‘rarely’ leave work on time. 6% said they ‘never’ leave on time. Now, while we would like everyone in the working world to be able to go home on time every day, we’re a bit more realistic than that. Sometimes, staying late in unavoidable and, sometimes, the decision to do so is a conscious choice. We know that the length of time spent at work doesn’t necessarily have a direct impact on a person’s perception of their work-life balance. The reality is, it all comes down to what makes us happy and how we feel about how much time we spend at work. So, it’s all about being self-aware – being conscious of how we feel every day. Regularly taking stock of this can help you to work out what is making you unhappy, and if this is something you need to work to change. So, what happens when we have poor work-life balance? Bear with us whilst we do some quick maths. A typical working day is 8 hours long (assuming you come in and leave on time, of course). So that’s 40 hours spent at work each week. Take in average commuting time (an estimated 49 minutes each way) and you’ve just ramped up 8 hours travelling to and from work a week. This is the problem. Work is important – really important – not only for putting bread on the table, but to allow us an opportunity to utilise skills, meet people, make a difference to the world, or to earn us a desired quality of life (whatever that is for you). But, we are more than our job titles. A lot more. Feeling out of balance can manifest itself in many ways in our lives. Most of us will have felt overworked, or burnt-out after a long or hectic week at work. But, if our jobs are impacting on our mental health and preventing us from making the most of life outside of the 9 to 5, it’s a problem. Create clear boundaries between work and home, so you can truly enjoy both – one at a time, without any guilt. Boundaries can be created, for example, by switching off work phone calls and emails when you leave work, or by being clear (and telling people!) about what hours you work and which you don’t. The real key for work-life balance is being able to prioritise exactly what you need to prioritise at any given time, across your work and home life. Sometimes you will need to put work first and, sometimes, your family or personal needs will hit the top of the priority list. Being able to choose which needs your attention most right now – and being able to take responsibility for that – is the ultimate for getting your work-life balance in check. Become really clear about what is most important to you – we life coaches tend to call these your “personal values”. Once you’ve identified these, build a lifestyle (including your career choice and working patterns) around that. There’s a possibility this might involve some difficult and potentially large changes, and you need to be open to recognising that. The question to ask yourself is, “what’s the sacrifice I’m willing to tolerate?”. This can help you to prioritise what’s worth spending your time on – and what isn’t! If you have more responsibilities than you have time for (and these days, who doesn’t? ), rather than focusing on how you can get more done with your time, change your approach and decide what you could do less of. Otherwise, eventually, the only thing that you’ll be doing less of (by default) is sleeping… Which is no good for your emotional or physical health! I often introduce a “what not to do” list with my clients, to help them see where they are doing things they don’t really need to, which are really another person’s responsibility or which could be done by someone else. To really make a big shift in your work-life balance, for many, the answer actually lies in being able to identify, and then overcome, more deeply-held root causes: finding it difficult to say no to other people, not wanting to ask for help, wanting to be in control of everything or being afraid to do things less than perfectly. These are really common traits that many of us struggle to overcome, and they tend to lead to us taking on more than we can possibly hope to achieve, and the overwhelm and stress that goes with it. Working with a coach could help you understand the factors that are impacting on your work-life balance. They can help you learn how to create more time for yourself, meaning you can really live your life to the full! To find a coach near you, use our advanced search tool. Sally: "My life coach enabled me to see things differently."